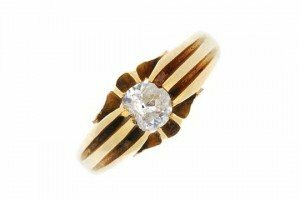 An early 20th century 18ct gold diamond single-stone ring. The old-cut diamond, within an extended claw setting, to the grooved band. Diamond chipped. 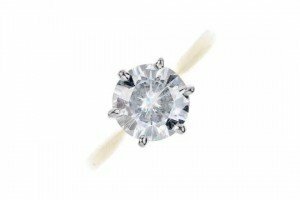 Estimated diamond weight 0.25ct. 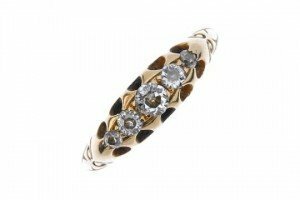 An 18ct gold synthetic moissonite single-stone ring. The circular-shape synthetic moissonite, to the tapered shoulders and plain band. Hallmarks for Birmingham. 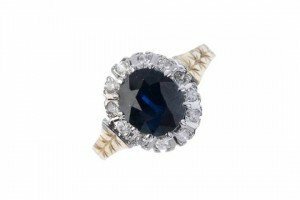 A 9ct gold sapphire and diamond cluster ring. The oval-shape sapphire, within a brilliant-cut diamond border, to the star engraved shoulders and plain band. Estimated total diamond weight 0.10ct. 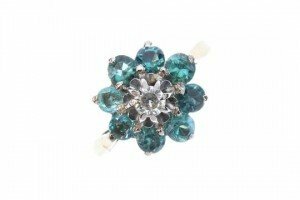 A gem and diamond floral cluster ring. The old-cut diamond, within a circular-shape green gem surround, to the plain band. Estimated diamond weight 0.10ct. 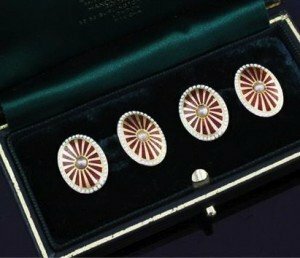 A pair of early 20th century 18ct gold, two colour enamel and seed pearl set cufflinks, of oval form, with starburst decoration, gross weight 9.1 grams, in Hancocks box. 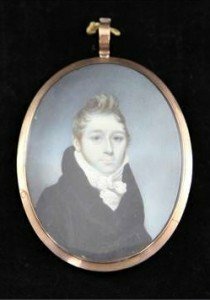 Early 19th century English Schooloil on ivory, Miniature portrait of a gentleman in a black coat, with hairwork back monogrammed JD,2.75 x 2.25in. 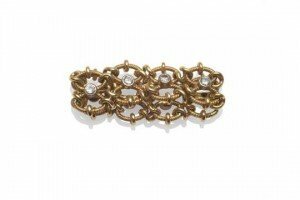 A Diamond Set Fancy Ring, rope twist figure-of-eight shaped links with a diamond collet set to the centre of each. 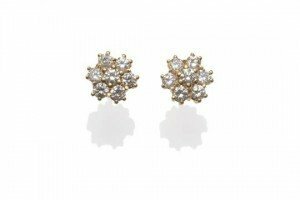 A Pair of Diamond Cluster Earrings, each set with seven round brilliant cut diamonds in yellow claw settings, total estimated diamond weight 0.90 carat approximately, with post fittings for pierced ears. 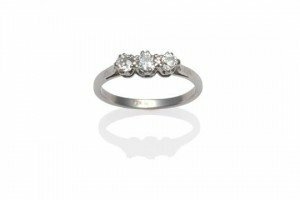 A Diamond Three Stone Ring, graduated old cut diamonds in white claw settings on a pointed shoulder plain polished shank, total estimated diamond weight 0.30 carat. 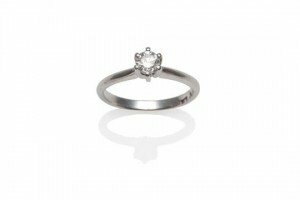 A Diamond Solitaire Ring, the round brilliant cut diamond in a white six claw setting, to tapered shoulders on a plain polished shank, estimated diamond weight 0.45 carat. 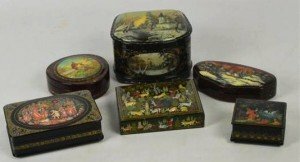 A collection of Russian lacquer boxes including a large example decorated with a wintry scene, signed, and another similar example with serpentine front, an unusual signed example with a chocolate/burgundy base colour, and two others, plus an Indian hand painted lidded box decorated with figures and many animals. 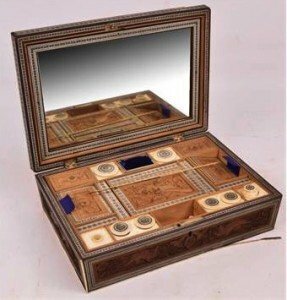 A late 19th century Anglo-Indian Vizagapatam workbox, the carved hinged lid set with a mirror and revealing a detailed interior of compartments and ivory and bone sewing accoutrements. 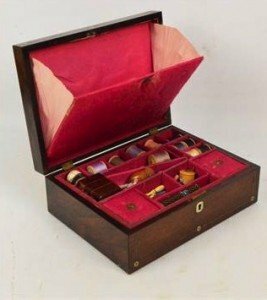 A late 19th century rosewood and mother of pearl inlaid workbox, the hinged lid enclosing a tray with various compartments including two with lids, containing various sewing implements and threads. 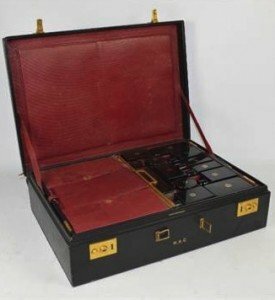 A Dupont travelling case with black exterior and red leather interior with fitted internal case containing black lacquer brushes, boxes, bottles, etc, to one side and three sections including mirror and manicure items, etc. 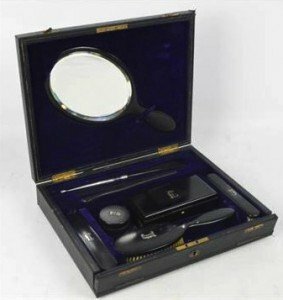 A leather cased ebony travelling set, comprising rectangular trinket box, hand mirror, hairbrush, a pair of clothes brushes, glove stretchers, combination button hook and shoehorn, and a powder jar and cover. 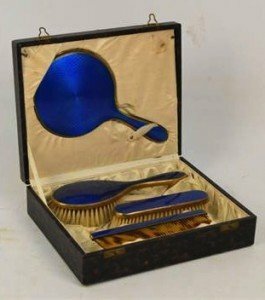 A cased three piece base metal and blue guilloche enamel decorated dressing table set, comprising a hand mirror, length 23.5cm, a hand brush, coat brush and a faux tortoiseshell comb. 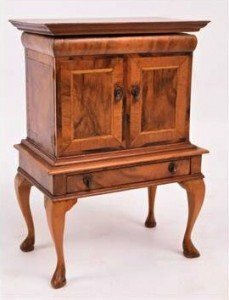 A contemporary jewellery casket modelled as a miniature chest on stand, the upper section with rising lid above two faux drawers and base with single drawer on cabriole legs. 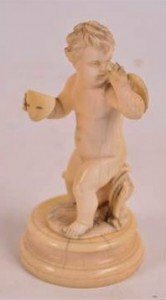 A 19th century Italian carved ivory figure of a Cupid holding a masquerade mask in one hand and thumbing his nose with another, on circular pedestal base. 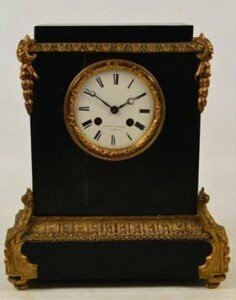 A late 19th century ebonised and gilt metal mounted eight day mantel clock with circular white enamel dial set with Roman numerals and inscribed “Stiffel & Cartier a Londres”, to stepped rectangular base.